Lori waits night after night for Superboy to stop avoiding her, lots of thoughts running though her mind about her half cousin. Conner too is having similar thoughts while also smarting from his break up with Cassie (Teen Titans #92). 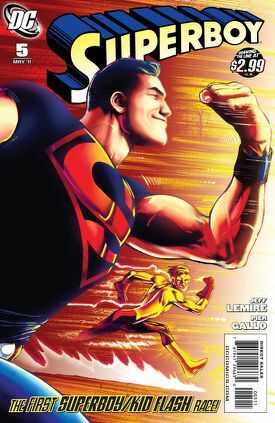 Of course other matters are pressing and a Titan versus Titan race awaits the Teen of Steel. The whole team is there to watch the Superboy/Kid Flash race... With the exception of Wonder Girl and her absence is painful for Conner. From the crowd Lori watches and is bitter at the attention Conner is getting and giving, especially because if it weren't for his recent fights there wouldn't have to be a fundraiser race. Former vice president turned Principal at Smallville High, Pete Ross, ushers the start of the race also announcing the Wayne Foundation and the Baron Winter fund have donated half a million to the redevelopment fund already. With greater purpose Bart and Conner begin the battle of the speedsters. Of course no superhero race is without its trials. A robbery in London, a battle with King Shark in Hawaii, catching a falling window washer in Canada, preventing an attack by the Royal Flush Gang in France... A race that ought to be fun still can't stop Conner from thinking about Cassie. Bart tries to soften the blow and Conner appreciates his efforts to be a friend and their quick heart to heart in Egypt ends in a flash. Back in Smallville, Sujan, aka Psionic Lad senses someone in the cheering crowd and spots the old man that had previously helped Superboy by forewarning of Parasite's attack. However as quickly as he spots the man's angry face, a distraction by Simon leaves Sujan wondering if he saw what his eyes had told him. The race is nearing the end and the two boys are pouring on the effort to win. They stop for another break when for a split second Conner sees Phantom Stranger outside Lori's house. The race won't wait for theories though and they continue to the finish line. 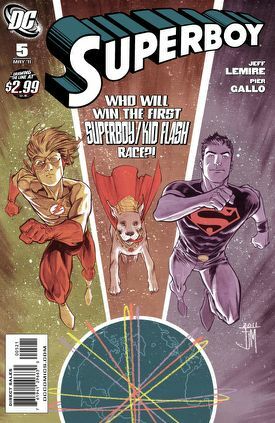 As fast as they are though, neither Conner nor Bart had figured that Krypto would be in the running too! In a blur of... fur, the Kryptonian Canine beats them both. While the cheers ring out, Raven approaches her friend and asks him about the supernatural forces she is feeling rise in Smallville. Simon asks about the connection between Lori and Phantom Stranger but neither he, Conner, Sujan or the Titans can figure out why all the paths of weird lead to Lori. Lena and Lori are watching the announcement of the world's fastest dog before Lori nips out of the house for her usual late night cigarette. Like nights past, she watches the sky but Conner yet again fails to appear, Lori resolves to control her own fate and heads back inside. What she doesn't see is the eerie glow of another inscribed tablet, similar to the one Conner and Simon are trying to decipher. Story - 3: I am really torn with this issue, the character work is again superb but suffers. The story is a fun ride but suffers greatly too. There are so many things weaving in that everything feels glossed over. Cassie is noticeably absent and considering the huge effect the break up has it is very odd to see Conner throw himself into the race, though of course distraction is a good remedy for pain. Then there is Sujan's plot, the Seer sculptor and Phantom Stranger threads that are only vaguely hinted at and the most difficult of all was the speed and thumbnail effect of the world tour. Instead of finding a balance the race and the character development scenes seem almost to fight for dominance, I hope this is a minor bump. Art - 3: Just like the story, the art flounders a lot this issue, struggling to depict the drama in between the exhilaration of the race. The thumbnail effect worked but it made things like the reunion of Superboy and King Shark in Hawaii a little lame as opposed to epic. Cover Art - 4: Unusually for me, I found this Barrows cover very likable. The digital coloring gives it a much warmer edge compared to the heavier line work in 'Grounded' (over in Superman). Yeah the anatomy of both Conner and Bart is completely warped but I can forgive it for the fun angle it's pushing. Cover Art (Variant Cover) - 4: The Manapul cover is equal in action to the direct edition, but the color wash effect doesn't do it any favors which is a shame as the first few anime style covers when Adventure Comics relaunched were superb.